I took the opportunity this month to do some more practicing with some of my filler stitches, specifically herringbone, peyote, RAW, and chevron. Each of these stitches has been adapted for bead embroidery. The tightly packed stitches like herringbone, peyote, and RAW are useful for achieving subtle variations in surface texture, while stitches like the chevron are more overtly decorative. 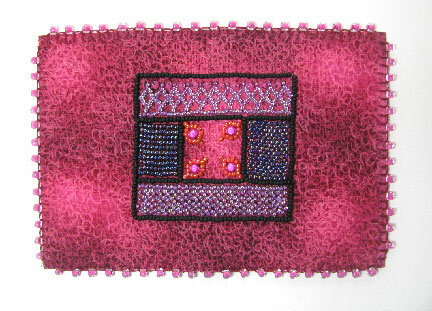 Information on how to turn these beadweaving stitches into bead embroidery stitches is found in Bored By Back Stitch. In a couple weeks when I catch up, I'll add a bit of a tutorial here! .guess I need to reread! LOL!! So little time, so many beads, Robbie! Yuumy - I love this color and look forward to learning more.